During the latter half of this week BBC Watch took part in the Global Forum for Combating Antisemitism conference which was held in Jerusalem. With some five hundred delegates from fifty countries and six different religions, one had the opportunity to hear first-hand of the situation in countries such as France, Hungary, Greece and many more – both in the official sessions and informal discussions. The chilling accounts given by some representatives were often shocking and overwhelming, but there was also cause for optimism, not least due to the forum’s focus on action-based outcomes. One of the most inspiring aspects of the conference was the participation of delegates of different faiths – united by recognition of the need to fight racial hatred. Some of the speeches made by Muslim leaders from Albania, Britain and France can be viewed here. Particularly notable was the address by Imam Hassan Chalgoumy of France – unfortunately not yet translated into English, but with a short summary available here. BBC Watch took part in the working group on antisemitism on the internet and in the media. The working group’s conclusions can be seen here and the report resulting from the working group’s last meeting in 2011 can be read here. The video below (starting at 09:00) is from a recent episode of the ‘Understanding the World’ internet programme in which Rabbi David Kaufman talks to Israeli diplomat Ishmael Khaldi (author of the book ‘A Shepherd’s Journey: the story of Israel’s first Bedouin diplomat‘) about a wide variety of issues including the Arab community in Israel and anti-Israel activity in Britain, where Mr Khaldi is currently based. The interview can also be heard as a podcast here. Readers no doubt remember that just three months ago BBC journalists produced several articles on the subject of Palestinian prisoners who were at the time on hunger strike. “One, Samer Issawi, has been on an intermittent protest for 200 days and is said to be in a critical condition. In March Ayman Sharawna agreed to be exiled to the Gaza Strip for ten years in return for his release from prison. Two months on, he is to be found yet again engaged in activities with the terrorist organisation Hamas, as shown in footage obtained by Israel’s Channel 2 TV station. “In the clip, shown on Channel 2 News Tuesday (Hebrew), Sharawneh [also Sharawna] can be seen donning combat fatigues and lacing up his boots before taking up a rifle and joining a patrol of Hamas’s military wing, the Izz ad-Din al-Qassam Brigades, along the Strip’s border with Israel. Sharawneh is shown joining a briefing with several heavily armed Hamas fighters and then posing as he aims a rifle from behind the cover of a tree. Just as it did not trouble audiences with the details of his original engagement in terrorism, there is little reason to anticipate any reporting by the BBC on the subject of Sharawna’s latest activities. BBC licence fee payers, however, might be wondering why – yet again – they are not being told the whole story. ‘Repetitio est mater studiorum’. So goes the old Latin proverb which alludes to the long recognised connection between repetition and learning. “Mr Kerry has called on Israel to prevent further settlement building where possible in the West Bank but has stopped short of calling for a total freeze. Palestinian officials want all settlement activity in the West Bank to stop before they return to negotiations with Israel. Israel says it will not accept any preconditions for talks. Israeli settlements in the West Bank are considered illegal under international law, although Israel disputes this. The same five sentences appeared in almost exactly the same form and order – albeit with other statements interspersed – in another BBC article published two days earlier on May 24th. So just how frequently are BBC News website readers exposed to the repetition of the narrative whereby “Israeli settlements in the West Bank are considered illegal under international law”? In addition to the two articles above, during the last four weeks alone that same message appeared in articles published on May 16th, May 9th, May 7th and April 30th: six times (at least) in four weeks. And yet, not once in any of those articles was the slightest attempt made to inform readers of the wider aspects of the issue beyond that trite slogan or to present alternative views on the subject or even to inform BBC audiences of the fact that there are opposing views to it which come from non-Israelis. One might almost think that the BBC does not want readers to be able to make up their own minds on the subject or to have informed opinions – preferring instead that they diligently learn the party line by rote. The BBC Jerusalem Bureau’s Yolande Knell appears to have launched something of a campaign. 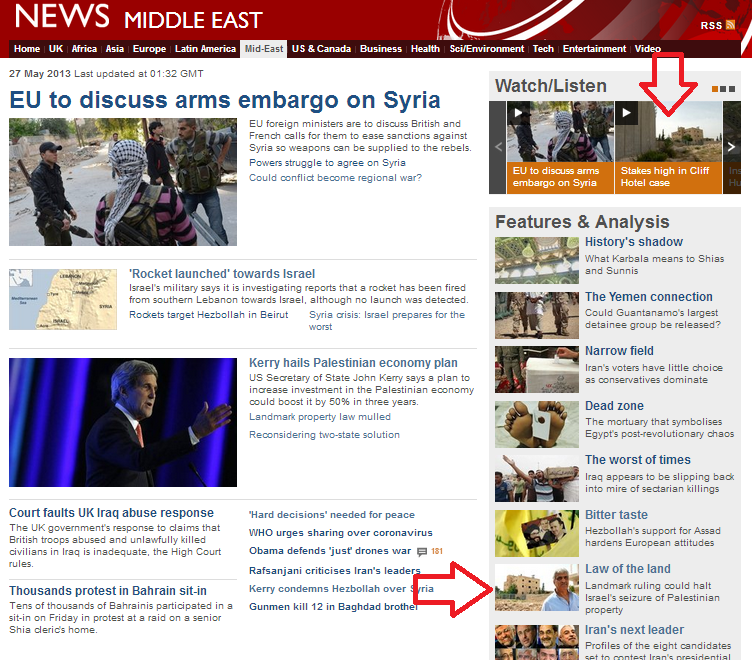 On the Middle East page of the BBC News website we find two items by Knell relating to the same subject. 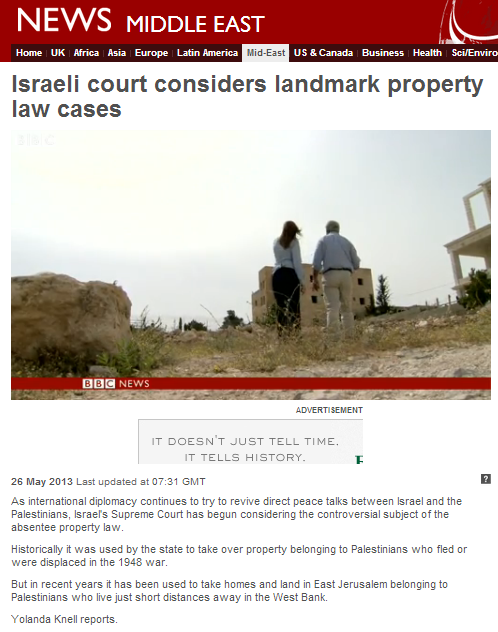 One item is a written article entitled “Israeli court considers landmark property law cases” dated May 22nd 2013, whilst the other is a filmed report with the same title from May 26th 2013 which was broadcast on BBC television news programmes. “The large building, erected by his father in 1954, was originally for residential use. It was converted into a hotel in the 1960s, and for many years Mr Ayyad was the manager. But one very important factor is overlooked by Knell in her story and that is that history did not begin in 1954 – or indeed in 1948. Ali Ayyad’s father, Abdel Hadi Ayyad – did indeed build in 1954 the house in Abu Dis which became known as the Cliff Hotel after its extension in 1964. Mr Ayyad senior – who died in 1978 – held Jordanian citizenship (and according to one Palestinian source was an officer in the Jordanian army) and never registered as a resident of Jerusalem after 1967. He has around a dozen heirs, four of whom live in Jordan, three in Kuwait, three in Palestinian Authority controlled areas, one in Norway and one in the United Kingdom. In the protocol one of the many court cases over the years on the subject of the Cliff Hotel, it is stated that in 2008 the heirs accepted the fact that the building lies within Israeli territory. Hence, Knell’s claim that “[t]he Israeli authorities now say that his building – which is close to the 1949 armistice line – falls within the boundaries of Jerusalem” [emphasis added] is at best disingenuous. Equally problematic is the fact that Knell suggests to readers that the issue of absenteeism revolves around Ali Ayyad – rather than his deceased father, as is actually the case. “Since 2003, the owners have faced several further attempts by Israeli authorities to seize the building. They are currently classed as “absentees” and the Custodian of Absentee Property controls the hotel. In this report Knell continues the BBC practice of quoting functionaries from political NGOs without making their affiliations and political motivations clear to audiences. Daniel Seidemann is the founder of ‘Terrestrial Jerusalem‘ and ‘Ir Amim‘. Knell devotes a considerable portion of her written article to the subject of the Israeli Absentee Property Law. Significantly – especially in this case – she makes no effort to inform readers of the fact that during the 19 year Jordanian occupation of Judea, Samaria and parts of Jerusalem (the later annexation of which was not recognized by the international community), there existed a body called the Jordanian Custodian of Enemy Property which was established to handle property seized from Jews during the War of Independence. “During the war of independence, the mandatory Jordanian legions conquered the area of Judea and Samaria, and in 1950 annexed the area. In the aftermath of the Jordanian occupation of the area, the appointed Jordanian governor published proclamation 55, declaring all residents of Israel as “enemies” of the state. This declaration enabled the application of the Trading with the Enemy Act, 1939, to the property of Israelis in the area. After the Six Day War and the subsequent end of the Jordanian occupation, property previously administered by the Jordanian Custodian of Enemy Property was transferred to the administration of the Israeli Custodian of Absentee Property, but the fact that the Jordanian authorities had frequently leased or sold Jewish-owned land to Jordanian citizens further complicated the legal situation. In Abu Dis – as is acknowledged even by Palestinian organisations – some 598 dunams of land are actually Jewish-owned. During the years 1920-30 the ‘Agudat HaDayarim’ Jewish Cooperative Society was established in Jerusalem in order to establish Jewish neighborhoods outside of the Old City for its members. The Society had over 210 members, from all walks of life and ethnic backgrounds including Persians, Iraqis and Yemenites. In 1928 the Aguda purchased 598 dunams of land in the area known today as Abu Dis – due to its proximity to the city centre – in order to build a ‘Garden Community’ (homes with agricultural plots). Although it acquired a legal title to the area, the Arab revolts of 1929 and 1936-9 prevented the Aguda from establishing the new community. The War of Independence resulted in the Jewish-owned lands in Abu Dis coming under the control of the Jordanian Custodian of Enemy Property. After the Six Day War and the subsequent reunification of Jerusalem, most of the Jewish-owned land in Abu Dis (some 540 dunams) remained outside of the city’s municipal boundaries and part of modern Abu Dis is built upon that land. Some 60 dunams of the land originally owned by ‘Agudat HaDayarim’ in Abu Dis does fall within Jerusalem’s municipal boundaries. Of course the BBC (strangely, for an organisation committed to accuracy) does not make a practice of informing its audiences about the subject of Jewish-owned lands in what it terms “the West Bank”, but the Jewish-owned lands in Abu Dis certainly should have been part of Yolande Knell’s research before she elected to co-opt the BBC to Ali Ayyad’s prolific media campaign. As we mentioned last week, the 2013 Global Forum on Antisemitism will be held between May 28th and 30th in Jerusalem. NGO Monitor has prepared an interesting paper for the occasion on the subject of the use of anti-Semitic themes and imagery by NGOs. With members of NGOs (sometimes identified as such and sometimes not) often being quoted and promoted by the BBC, the subject is of course especially relevant. The report can be read here or in pdf format here. “Bitter taste”. That was the curious choice of wording used to headline a May 23rd article about Hizballah by BBC diplomatic/defence correspondent Jonathan Marcus in the ‘Features & Analysis’ section of the Middle East page of the BBC News website. The use of such emotion-orientated language may well cause readers to wonder if they are reading about reactions to a candidate in a phone-in TV talent contest rather than evidence-based assessments of an international terror organization. Disappointingly for any readers seeking accurate information on the subject of Hizballah, Marcus chooses to perpetuate the myth of a separate ‘military wing’ to that organization. In fact, the 2004 designation of Hizballah as a terrorist organization by the Netherlands rightly makes no distinction between its ‘military’ and ‘political’ wings, as shown on page 19 of the General Intelligence and Security Service Report for that year. Of course Hizballah itself is perfectly aware of the potential effects of designation upon the organisation as a whole, as expressed by Hassan Nasrallah in 2005. Bizarrely, the BBC’s diplomatic/defence correspondent only now seems to have discovered the fact that Hizballah is an Iranian franchise – a fact which has been obvious to most other people with any knowledge of the Middle East for years. Marcus does not take the trouble to explain to his readers what lies behind the romantic-sounding propaganda slogan “resistance”, as laid out in Hizballah’s original 1985 “open letter”. “We see in Israel the vanguard of the United States in our Islamic world. It is the hated enemy that must be fought until the hated ones get what they deserve. This enemy is the greatest danger to our future generations and to the destiny of our lands, particularly as it glorifies the ideas of settlement and expansion, initiated in Palestine, and yearning outward to the extension of the Great Israel, from the Euphrates to the Nile. The move by EU countries to finally designate Hizballah as a terrorist organization is, of course, both necessary and long overdue. Whilst Jonathan Marcus’ analysis of the reasons behind that shift may be useful, the fact that he is apparently unable to avoid the temptation of adopting and promoting the terrorist organisation’s own narrative with regard to the euphemism of “resistance” does not enhance BBC audience’s understanding of Hizballah or the basis for its designation. 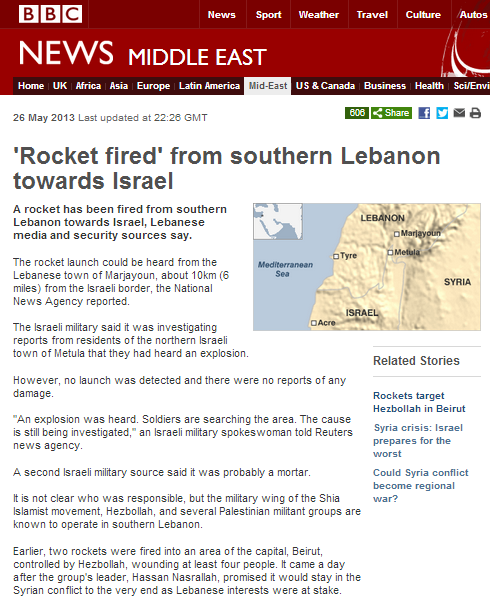 On May 26th 2013 the BBC published an article on the Middle East page of its BBC News website under the title “‘Rocket fired’ from southern Lebanon towards Israel” and quoting Lebanese “media and security sources”. The BBC article was published at 22:26 GMT – about half an hour after initial reports of an explosion having been heard in the vicinity of Metulla came to light shortly before midnight. Later in the day the IDF confirmed that no missile had fallen in Israeli territory, but the BBC report has not been updated to reflect that fact. Metulla – founded in 1896 – is of course not a “settlement”. But of course to Hizballah supporters such as this former BBC employee, it too is illegitimate – as we see from a translation of Hashem’s second Tweet. All too often the BBC has failed to report on missile fire directed at Israeli civilians in the region surrounding the Gaza Strip or, more recently, in the Golan Heights. Curiously, in this case it appears to have somewhat jumped the gun. 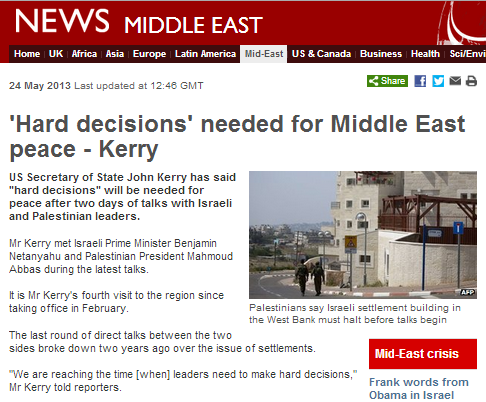 An article entitled “ ‘Hard decisions’ needed for Middle East peace – Kerry“ appeared on the Middle East page of the BBC News website on May 24th 2013. The article – which ostensibly reports on the subject of the recent visit to the region by US Secretary of State John Kerry – devotes a considerable amount of space to promoting the habitual BBC mantras of ‘settlements as an obstacle to peace’ and ‘settlements are illegal under international law’. However, the telegram-style clichés repeated in this article, as in countless others, not only fall short of contributing to BBC audiences’ gaining comprehensive understanding of the issues at stake, but actively prevent them from doing so. This pro forma statement is so well-worn that BBC editors have apparently not noticed that it is no longer accurate even from the point of view of its time-scale. The Palestinian Authority refused to continue direct negotiations in late September 2010 – two years and eight months ago. The statement fails to inform readers that prior to that break-down in talks, a ten-month freeze on construction had been implemented by Israel in order to encourage the renewal of discussions, but the Palestinian Authority failed to come to the negotiating table for nine of those ten months and then used the end of the construction freeze on September 26th 2010 as a pretext to refuse to continue talks. This statement misleads BBC audiences by implying through the use of the phrase “further settlement building” that new towns and villages are being constructed in Judea & Samaria and by failing to make clear that in fact the issue is building within the municipal boundaries of existing communities. “Palestinian officials want all settlement activity in the West Bank to stop before they return to negotiations with Israel. Last week the Israeli government took steps to authorise four Jewish settlement outposts in the occupied West Bank. As usual, the BBC conceals from its audiences the fact that there are differing legal opinions on the subject. Note the repeated use of the term “Jewish settlements” rather than ‘Israeli’. Communities in Judea & Samaria were built under the auspices of successive Israeli governments – all of which were democratically elected by the entire spectrum of the Israeli people – including the 20% or so who are not Jewish. An average reader of this article would go away convinced that building in communities in Judea & Samaria is the main issue preventing a peace agreement between Israel and the Palestinians. So let’s take a look at just some of what the BBC has to airbrush out of its ‘peace process’ narrative, as presented in this article and many others, in order to promote that chimera to its audiences. 1. The Palestinian Authority’s insistence on the ‘right of return’ for refugees: a scenario which would bring about the end of Israel as a Jewish state. 2. The Palestinian Authority’s refusal to recognize Israel as a Jewish state. 3. The fact that Mahmoud Abbas does not hold a legitimate democratically elected mandate to sign any agreement on behalf of the Palestinian people. 4. The fact that part of the territory intended to be a Palestinian state is not controlled by the Palestinian Authority, but by a terrorist organization at war with Israel. 5. The fact that the ‘international community’ seems to be entirely at ease with the deliberate suspension of the rights of the Palestinian people to elect their leaders and representatives in order to keep the Palestinian Authority on ‘life support’ by postponing a Hamas take-over of the PA.
6. The fact that the Palestinian Authority engages in daily delegitimisation of Israel, incitement against the Israeli people and glorification of terror. 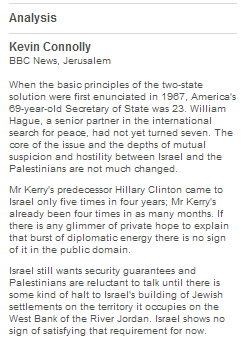 The BBC’s article also includes ‘analysis’ by the Jerusalem Bureau’s Kevin Connolly. “When the basic principles of the two-state solution were first enunciated in 1967, America’s 69-year-old Secretary of State was 23. William Hague, a senior partner in the international search for peace, had not yet turned seven. The core of the issue and the depths of mutual suspicion and hostility between Israel and the Palestinians are not much changed. Mr Kerry’s predecessor Hillary Clinton came to Israel only five times in four years; Mr Kerry’s already been four times in as many months. If there is any glimmer of private hope to explain that burst of diplomatic energy there is no sign of it in the public domain. There’s Connolly once again implying that new communities are being built in Judea & Samaria as we read – rather than housing units in existing towns and villages – and using the term “Jewish settlements” instead of Israeli. But note Connolly’s first paragraph in that ‘analysis’. The opaquely phrased claim that “the basic principles of the two-state solution were first enunciated in 1967”, followed by the use of the term “hostility between Israel and the Palestinians” deliberately airbrushes out aspects of the conflict which are vital in contributing to readers’ understanding of it. Connolly’s reference to 1967 presumably means the Khartoum conference, but to interpret the results of that as enunciating “the basic principles of the two state solution” (whereby, according to its accepted definition, the State of Israel and a Palestinian state exist peacefully side by side) is a pretty far stretch – and one which not only downplays Arab countries’ involvement in the conflict, but ignores the third attempt by Arab states to annihilate Israel six years later. The BBC systematically sells its audiences short by failing to contribute to their understanding of why the peace process has failed to make any significant progress through the repeated airbrushing out of the picture of factors of considerably graver consequence than the subject of building in “settlements”. That practice not only seriously damages the BBC’s reputation for accuracy and impartiality, but also fails to meet the requirements of the “public purposes” set out in the BBC’s charter. It is high time the BBC made some (apparently) ‘hard’ decisions of its own regarding its seeming unwillingness to meet its obligation to inform audiences accurately rather than making do with the incessant promotion of a specific political narrative. One place to start, for example, would be an in-depth feature on the subject of the Palestinian Authority’s glorification of terror and the effects of that on the chances for peace. I have to admit that the perceived value of – and financial justification for – a superficial poll recently carried out on behalf of the BBC World Service escapes this writer completely. 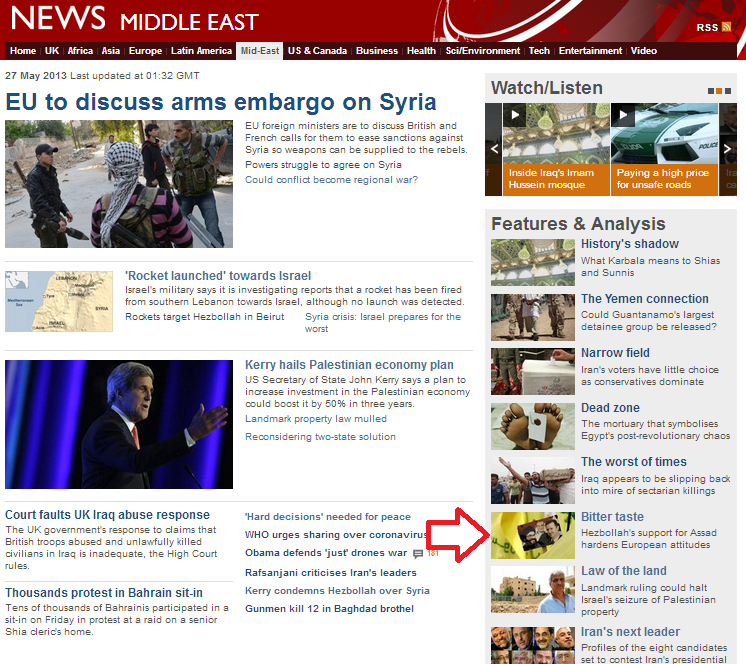 Nevertheless, the BBC saw fit to promote its results on the BBC News website as though they were of some significance. Visitors to the UK page of the website could ponder the question “Why has the UK gone up in people’s estimations?“ and those reading the Europe or Middle East pages would learn that “Germany most popular country in the world“. Except the headline writer got it wrong: those polled were not asked which country they liked best, but whether they perceived a country’s “influence in the world” as being generally positive or negative. Neither of those articles bothers readers too much with the survey’s methodology. 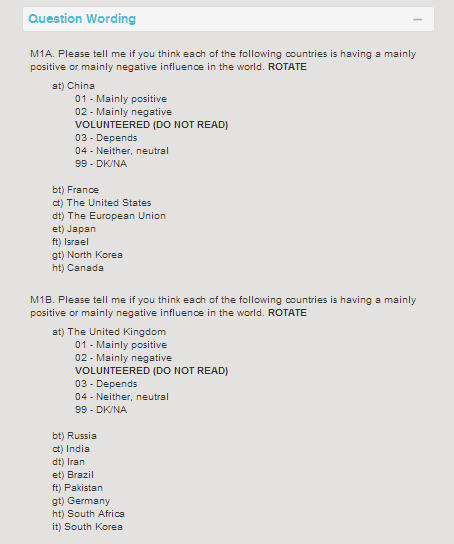 To learn more about that, we have to the pollster’s website where we see that the BBC’s statement that “more than 26,000 people were surveyed internationally for the poll” in fact means that people were polled in just twenty-five countries. We also learn that those polled were only asked for their opinions on sixteen countries and the European Union. Nobody asked them for their opinions on the positive or negative global influence of – for example – Sudan, Syria or Somalia and we will never know if in fact New Zealand is actually the “most popular country in the world”. 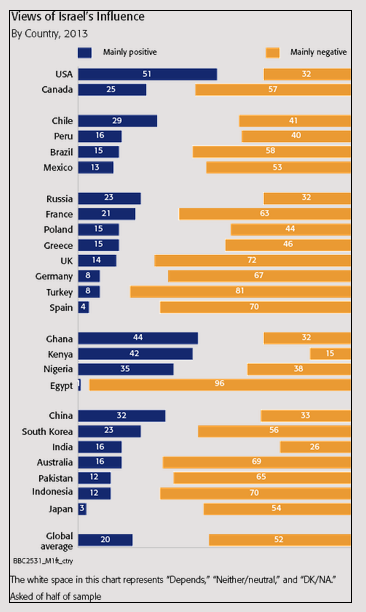 Given that among the countries in which people were polled we find the country deemed the most antisemitic in Europe along with Egypt, Pakistan and Turkey, it would be very surprising if Israel did not come out badly in this particular pageant. Obviously, no meaningful conclusions whatsoever can be drawn from this BBC World Service exercise, but what would make it more interesting would be to find out how many of the poll’s responders define themselves as regular consumers of BBC content.